When I was about 9 years old, my Pop took me with him to a BBQ at a small ranch on the outskirts of Las Vegas. To my delight he was convinced to buy a horse that a woman described only as “green broke”. He paid $50 bucks sight unseen for my new best friend. Somewhere between the tall tales and the sheer volume of Budweiser, he completely forgot about his purchase. The next morning he was surprised by a phone call from the woman asking him to come pick up his horse. The beast was located about a half a mile from the small ranch where we had been the night before so we called the owner to ask what we should do about this little filly. She offered her boarding and training services – Aleda became a fixture of my life for the next several years. Ever since that day I have thought about chickens as pets. I’ve never owned one, but I’ve admired many. When I see the Tyson truck jammed full on the highway I feel a bit saddened. 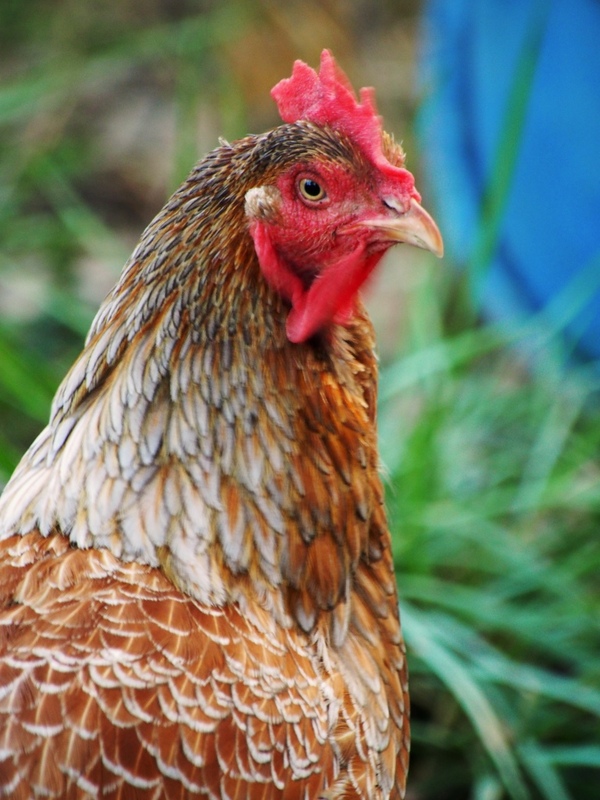 Now I’m not saying that you shouldn’t eat your chickens, I’m just saying that they are some pretty amazing creatures. Their personalities are pretty distinctive. 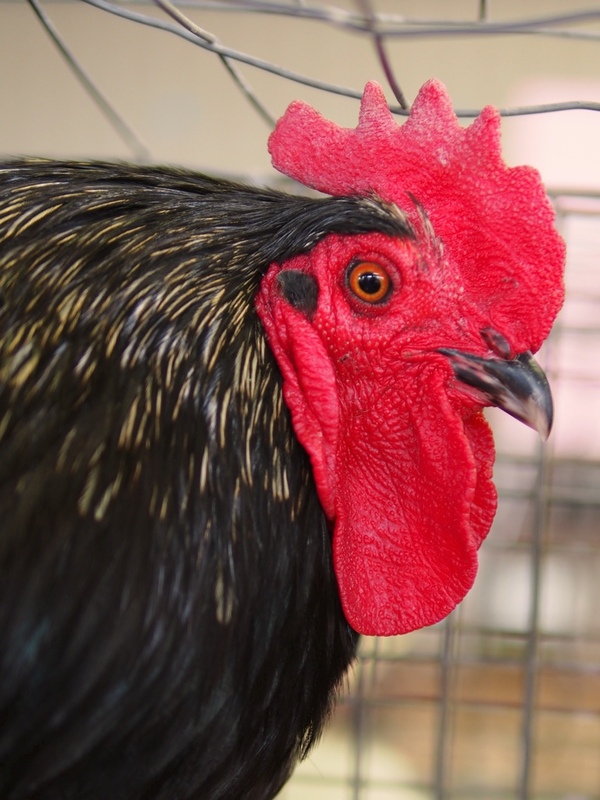 My brother Max writes an informative and earnest blog about his chickens – The Fruity Chicken. Through his eyes I have come to see the humor and majesty that these wonderful creatures posses. This is Gamer – she’s owned by my friend and bird art feeder source (The Norberta Philbrook Gallery) Raven. She says this is the smartest chicken in the yard. 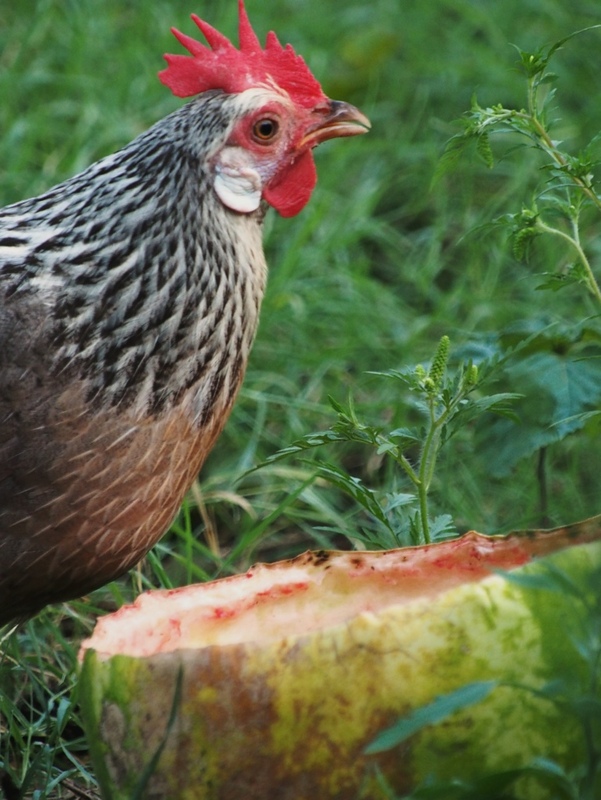 I saw her eating out of this watermelon rind like it was a bowl – clearly a smart chick. 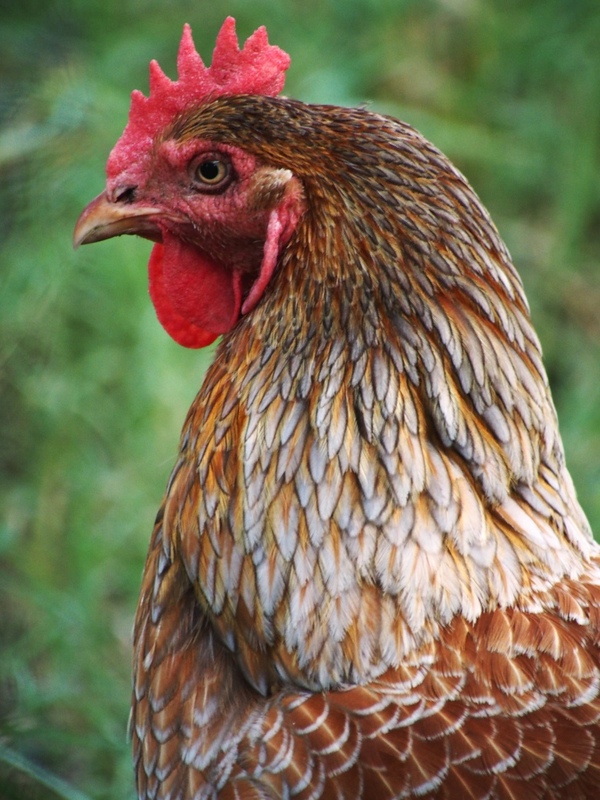 This hen has amazing plumage and serious attitude. Raven says she’s at the top of the pecking order and it shows. She never drops the attitude while giving me the eye. 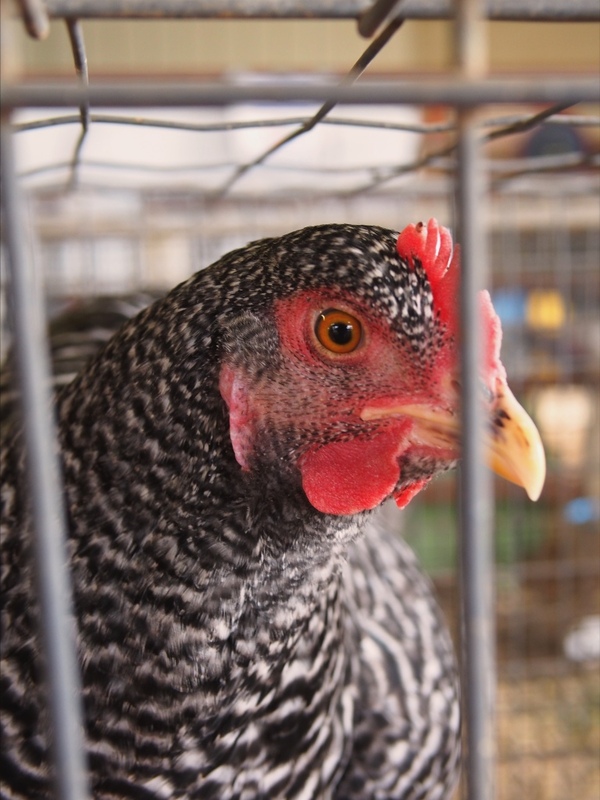 I got a chance to go to the county fair last week and gaze upon some prize-winning chickens. My 99-year-old friend Mary Jane was with me and although she was unwilling to be photographed (I think she belongs to some uber secret chicken whispering society) she was able to get them to talk back to her. This guy was all about the profile – poser. This girl’s been inside too long – clearly looking for an opportunity for a jail break. 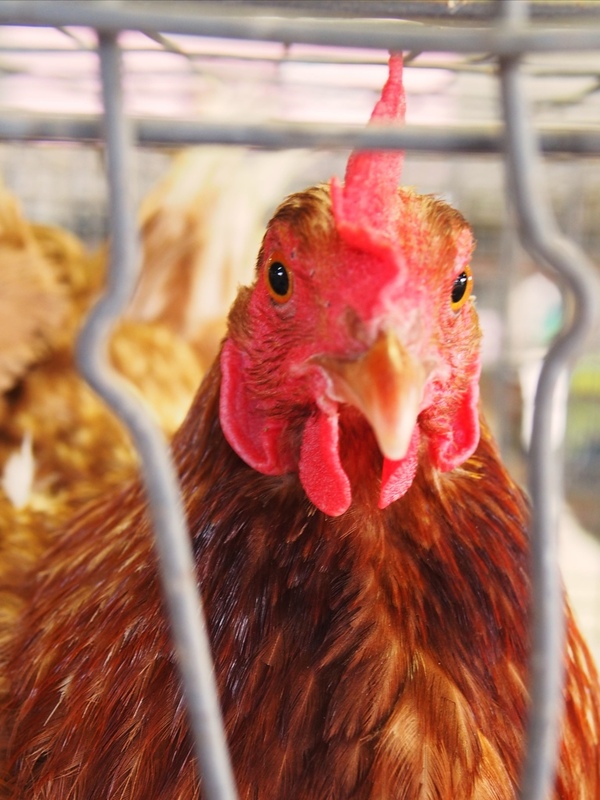 This chicken was the most amazing of all – its “Kreskin-like” powers have enabled it to bend the bars of its prison to its own will, echoing the very shape of its piercing eyes. Who could eat any of these characters? You don’t eat your friends. 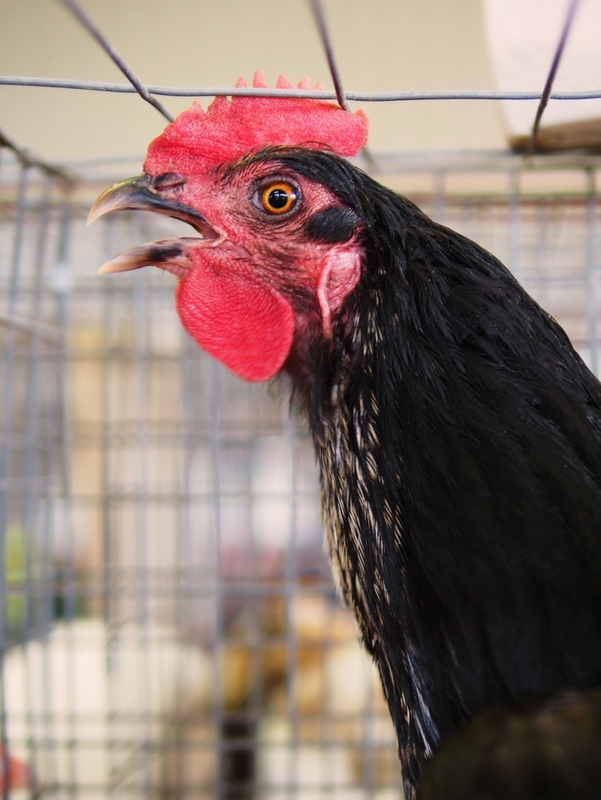 This entry was posted in birds, Photography, Reminiscences and tagged Chickens, county fair, Olympus E-M5, OMD, pecking order by artsifrtsy. Bookmark the permalink. Email me at artsifrtsy@yahoo.com and I can get you a good sized image. Most of them are gone by October 10th. I once had a friend who was raising a steer for meat. She called it “Meatloaf” in order not to lose perspective. Ron, my feeders have been slammed, lots of air battles going on too. How long will they linger here? I love the Kreskin bird. He is my favorite too – those eyes are powerful…. Up this close they certainly have beautiful plumage. I’m a vegetarian, so I never eat friends. Though I may bite, if people annoy me too much. LOL – I’ll watch my step! Thanks! My Pop was a corker:) I have thought about having some – I love their quirky personalities. 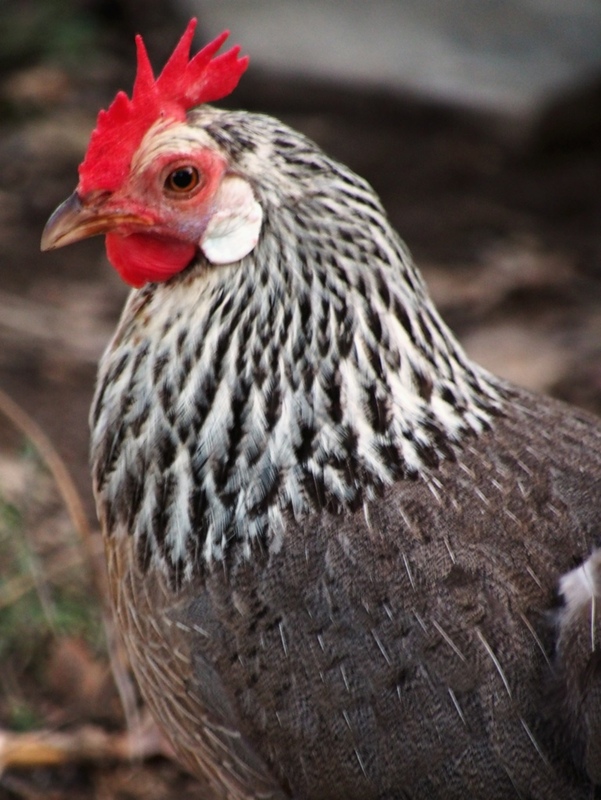 Nope – once you have a relationship with an animal it ceases to be food for me. I have a problem with rabbit. My brother shot several of them on his property (plague proportions) and skinned a baby one & brought it down to me in the city. As I was cleaning it, tears started forming and I couldn’t eat it. Ooh Boy! Didn’t Karen tell you about Christmas dinner this year? Not the ducken????? I promise – I’ll bring a ham! LOL – Send me a calendar invite! I used to have laying hens and let me just say they’re no good for eating! Good thing – I never have been able to eat something I spent a lot of time with. My pop won two live turkeys one year at Thanksgiving. I ate the first one with the family – by Christmas I was too attached.